How about something ‘out of the bucket’? It is no secret that the advertising is truly a tricky industry with constant evolution and changes to cater to the taste of Filipino consumers. Although we had been bombarded by television and social media advertisements that give us all the ‘feels’, one company is trying to break out the stereotype by coming up with what Filipinos originally loved; good old sense of humor. In a Facebook video uploaded by KFC Philippines, the American restaurant brand launched its search for the first KFC Filipino Colonel. It features three of the country’s top veteran actors namely Ronaldo Valdez, Leo Martinez and Penn Medina. 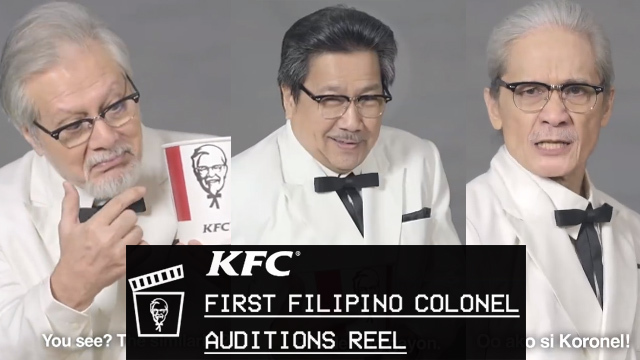 The clip shows how the three actors auditioned for the role of KFC Filipino Colonel with Valdez showcasing his charm, Martinez exhibiting his comedic skills and Medina slaying with his acting prowess. When it comes to resemblance, Ronaldo Valdez and Colonel Sander’s was uncanny. He even got the smooth charm that perfectly resembles the Colonel. But if you are thinking about a ‘Pinoy Colonel Sanders,’ Leo Martinez would not be a bad choice either. His Batangueño accent screams pinoy. Plus, his goofy antics can tickle the funny bone of many Filipinos. How can we exclude Pen Medina from the choices? He resembles a brave and strong Colonel Sanders. Though on the clip, he mistaken the audition for that of a real military colonel, it was hilarious how the rest of his audition turned out. On May 29, KFC will reveal the first KFC Filipino Colonel, but it doesn’t stop netizens from voicing out their early favorites. Harland David Sander, famously known as ‘Colonel Sanders’ was the founder of the fast food chicken restaurant chain Kentucky Fried Chicken or KFC. He became the company’s brand ambassador and symbol up to now.